Nano Nagle was born in Ballygriffin, Cork, Ireland in 1718. Nano spent a happy childhood in her family home and during this time, developed a strong faith. Because of the Penal Laws in Ireland at the time, she was unable to receive an education in a public school. Instead, she was educated at an illegal “hedge school”, and later she travelled to France to continue her education with her relatives. After her father died, Nano returned to Ireland. She soon became aware of the social injustice of the penal code and the poverty it inflicted on people. She decided she would provide education for those children who were not permitted to attend public schools. Nano secretly rented rooms in various parts of the city of Cork, and started classes for children. Soon she had seven schools containing four hundred children, five schools for girls and two schools for boys. Nano’s dedication to the poor was not confined to schools. In the evenings, she searched the narrow streets, guided by a lantern, to alleviate distress among the sick and destitute and to share with them God’s love. She became known as “The Lady of the Lamp”. After many years of service to the poor, Nano’s health began to fail. She decided to found a religious Congregation which would continue her work. This was the beginning of the Presentation story. Many young women joined the Congregation of the Presentation Sisters and migrated to different areas of the world to continue Nano's work. people of Emerald. Mother Superior Patrick was an accomplished musician and fostered singing, piano and violin playing. The school opened with an enrolment of eighty pupils in one room. Many children were unable to attend school because of distance. 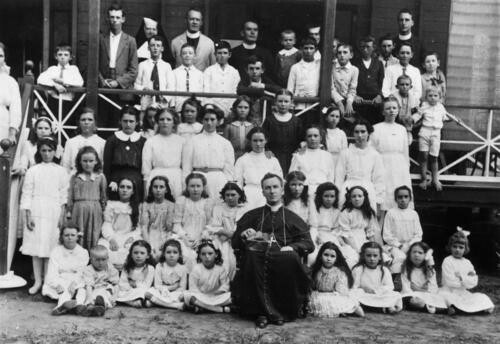 As a result, the Sisters started a boarding school, originally for girls and then for boys at St Patrick’s in 1906. Boarding concluded in 1961. In 1912, during a cyclonic storm, the little school was badly damaged. A new school was opened on 25th April, 1915. Probably one of the unique activities the Sisters initiated was the ‘moonlight sports’. Eventually, they were combined with a fete and a dance which today, has become our annual fair which is a wonderful community event. education program, a comprehension learning support department, classroom music lessons and modern teaching opportunities including the use of ipads and other technologies.